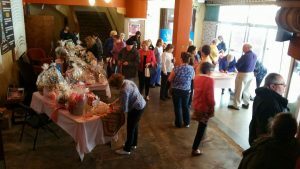 Lunafest is a fun, enlightening event for women and men alike. Photo credit: Kerry MacGregor Serl. Attention ladies – want to have fun with friends, support a great local organization and enjoy ground-breaking films? The Lewis County Branch of the American Association of University Women (AAUW) hosts the second annual Lunafest on April 27, 2019 at Centralia College’s Corbet Theatre. Social hour begins at 1:00 p.m. with complimentary appetizers and wine. Purchase tickets for the fun raffle drawing for awesome local items. The screening of nine short films by, for and about women begins at 2:00 p.m.
AAUW has empowered women as individuals and as a community since the 1800s. The Lewis County AAUW is ninety-five years old. The organization has evolved over time, yet consistently looks for women who want to get things done in the community. With a mission statement of extending education, equity, diversity and philanthropy for women and girls, AAUW lobbies and uses grassroots efforts to promote policies that break down barriers for women. The female owners of the Luna Bar corporation created Lunafest to raise awareness about women’s issues, highlight women filmmakers and bring women together in their communities. In addition to the Human Response Network, some of the proceeds benefit Chicken and Egg Pictures, supporting women in documentary films. Photo credit: Kerry MacGregor Serl. 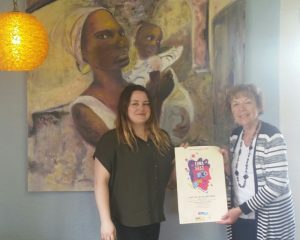 Lunafest is benefiting Human Response Network, whose mission is to end the cycle of violence with ongoing support to those who have experienced domestic violence or sexual assault. Through advocacy, education and providing legal help, the organization empowers the vulnerable to become self-sufficient. This is especially powerful because domestic violence is the leading cause of homelessness for women and children nationwide. Jena Sorenson, Board Chair of the Human Response Network, says there has been an increase in demand for services since last year. 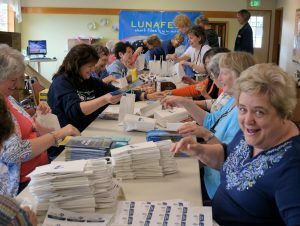 AAUW members assemble gift bags for attendees of Lunafest. Jena with Human Response Network says, “The ladies at the AAUU really carry the load for putting this event on for us, and we are really thankful for that.” Photo credit: Kerry MacGregor Serl. With submissions from all around the globe, these brand-new films are often ones you wouldn’t normally see. “It’s a fun thing for BFFs or moms and daughters,” says Leth, who recommends attendees be at least sixteen or over due to some mature content. In 2018, Human Response Network assisted 787 clients in a domestic violence or sexual assault situation for a total of 6,750 hours. Tickets for Lunafest are $20 and are available now at local businesses Book N Brush, The Station Coffee Bar, Shakespeare and Company, Boccata and Santa Lucia Coffee. Tickets are also available online or at the door. If you or someone you know needs help, contact Human Response Network 24 hours a day at 360-748-6601, toll-free at 800-244-7414 or in Español at 360-880-0515.